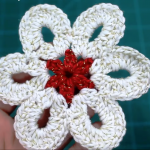 Today at www.crochet-ideas.com we are going to learn how to make a lovely flower in 7 minutes. As you can see on presented pictures this flower looks pretty and versatile. 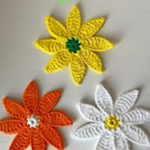 You can use it to brighten up your accessories, such as scarfs, bags, hats or add on your simple blanket. 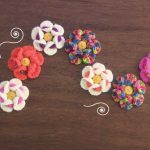 Also you can make many of them and use as a crochet ornament. 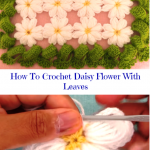 Use your fantasy, imagination and master skills and start crocheting this lovely flower right now. It is not difficult and working process is very funny and entertaining. The video instruction is well-explained and we hope you will easily understand it. Please enjoy and do not forget to share with friends!! !